The Belleek basket tree ornament was introduced in 2014. Sorry this Belleek ornament is now sold out. 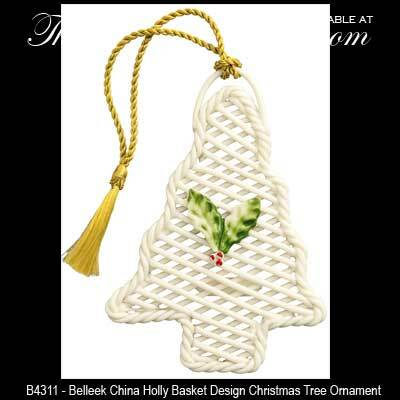 Belleek has woven delicate strands of china to create the basket tree ornament. The Belleek basket weave tree features hand-painted holly and berries and it is ready to hang on your Christmas tree with the included gold cord. The Belleek Christmas tree ornament measures 2 3/4" wide x 4" tall x 1/4" thick.